This section is from the book "The Construction Of The Small House", by H. Vandervoort Walsh. Also available from Amazon: The construction of the small house. It is possible to enter into a long discussion of the classes, qualities, methods of conversion, defects of wood and similar subjects, but these are not pertinent to the main idea, namely, the essential qualities of woods which are used in the construction of the small house. There is a prevalent impression abroad that the supply of wood is becoming so depleted that it will in the future be used only for special ornamental features. This is wrong, for we still have enough virgin forests left to supply the country for several generations, and with the growth of forestry we will maintain a certain source of supply. We have two classes of woods on the market which are used in different parts of the structure, according to their special qualities. These are commercially known as hard and soft woods, although this is not a very scientific distinction, since some of the soft woods are harder than some of the hard woods, and vice versa. Scientists have more accurate names than these, but as the above are so well established, there is no doubt as to what is meant. In the market, lumber is not only classified according to the above, but according to the species of tree it comes from, and also according to certain standard grades of the same kind. These grades are determined by the presence of certain defects. The recognized defects are knots, shakes, checks, splits, streaks, pitch-pockets, stain, rot, wane, warp, cupping, mineral streaks, pith on the face of the board, and worm-holes. Various large lumber associations issue rules governing standard sizes and classifications for woods to be used in construetion. The best and the next best are the usual grades which are used for the interior and exterior trim of houses. These grades have many designations, as "clears" and "selects," or "A" and "B," or "No.1" and "No. 2," or "firsts" and "seconds." Waney edges Star and ring shakes Knots, Common timber defects. The grades used for the rough framing, such as studs, joists, rafters, subfloors, and sheathing, are not so good. They are designated as "No. 1 common" and "No. 2 common." A poorer grade still, known as "No. 3 common," is sometimes used for cheap temporary structures. For the details of grading and standard sizes of lumber, one should possess Circular 64 of the United States Department of Agriculture on "How Lumber is Graded." Next to the grading of timber, the most important factor of quality is the relative durability of the various woods, for upon this depends to a large extent the choice of them for special places. The table on page 23 is taken from a government classification. From this table it will be noticed that the soft woods as a class are relatively more durable than the hard woods. This is true, because of the fact that the structure of soft woods is simple, while that of the hard woods is complex. When the former become wet and expand and then dry out and shrink, the structure is not stressed internally as much as is that of the hard woods, and they are therefore much more capable of withstanding the action of the weather. Also certain of the soft woods have natural properties of resisting dry or wet rot. Certain species of woods are, therefore, selected for particular parts of the house according to the needs of durability, strength, appearance, and local supply. Rough wooden framing requires a wood that is fairly abundant and strong. The soft woods are generally used, and those which are classified as durable in the table are the most used. For rough underflooring and sheathing the cheapest and most abundant local wood is used. Durability is not essential. For shingles the most durable woods must be used, such as cypress, cedar, and redwood. Lath are generally cut from waste slabs, and should be of some soft wood like spruce or of one of the softer hard woods. Siding should be made from one of the soft woods, especially those which are classed as durable in the table. Porch columns and the like require very durable woods. They should be hollow except for very small ones. Built-up columns of interlocking type are usually specified, but the lumber used should be thoroughly kiln-dried so that the joints will not open. Flooring should be capable of resisting wear and should not splinter. The hard woods as a class are more adaptable than the soft woods, although yellow pine and Douglas fir are used a great deal on account of their cheapness. These latter are divided into two grades: "flat grain," in which the annual rings are almost parallel to the surface, and "edge grain," in which the annual rings run almost perpendicular to the surface. The latter is more desirable, since it wears better. The flat grain splinters off, due to the layers of soft spring wood and hard summer wood. Oak flooring comes plain and quarter sawn, which is practically the same as the cut of yellow pine, but since oak is strong either way, the wearing qualities are not very different. Maple is also an excellent wood for flooring, since it is hard and smooth. Edge grain, Difference in the cut of flooring boards. Flat grain, The flat grain in the softer woods is not durable. Door and window frames may be made from many kinds of wood, although the soft and more durable woods are generally accepted as the best. Specially hard and durable woods should be used for the thresholds. Doors which are to be used on the exterior should be of a soft and durable wood. The choice of wood for interior doors is limited only by the taste of the designer. The doors which stand best the warping effect of steam-heat in the winter are constructed of white-pine cores with a veneer on the exterior made from some hard wood. Sash and blinds require a soft and durable wood. Sash are subject to the drying of steam-heat on the interior and cold and dampness on the exterior. 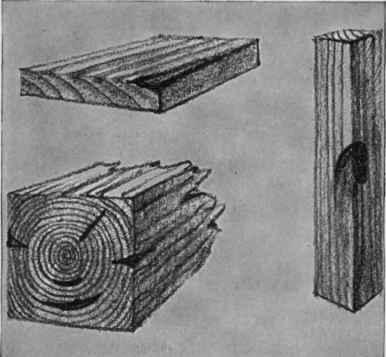 Sash built of yellow-pine sap-wood have rotted in a few years, and while soft maple, birch, and basswood have been used, they are not durable, although easily worked. White pine is considered to be the best for sash and blinds. The selection of woods for interior trim depends only upon the designer's taste, since neither relative durability nor strength is a requirement. The harder woods in the past have been used more extensively for interior trim than the soft, because of their supposedly better and richer appearance, but this is not so true to-day, for new methods of treating such woods as cypress and yellow pine have shown them to be fitted for the best artistic places. Of course hard woods are not dented from knocks by furniture as easily as the soft woods, and in this way retain their appearance longer.